Graves just co-wrote the piece “Brett Kavanaugh Can’t Be Trusted. We Know Because We Worked as Counsel to Senators When He Was in the Bush White House” for Time magazine. She also recently wrote the piece “I Wrote Some of the Stolen Memos That Brett Kavanaugh Lied to the Senate About” for Slate. She is the former chief counsel for nominations for the ranking member of the Senate Judiciary Committee and was deputy assistant attorney general in the Department of Justice. Graves is the co-founder of Documented, which investigates corporate influence on democracy. 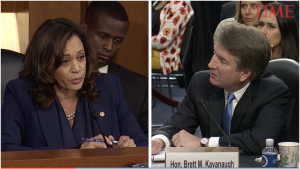 She writes that Kavanaugh should be removed from his current judgeship “because he was repeatedly asked under oath as part of his 2004 and 2006 confirmation hearings for his position on the U.S. Court of Appeals for the D.C. Circuit about whether he had received such information from [GOP Senate aide Manuel] Miranda, and each time he falsely denied it. “In 2006, Sen. Ted Kennedy asked him if he had any regrets about how he treated documents he had received from Miranda that he later learned were stolen. Kavanaugh rejected the premise of the question, restating that he never even saw one of those documents. Graves writes: “He lied. Under oath. And he did so repeatedly. “Significantly, he did so even though a few years earlier he had helped spearhead the impeachment of President Bill Clinton for perjury in a private civil case. Back then Kavanaugh took lying under oath so seriously that he was determined to do everything he could to help remove a president from office.